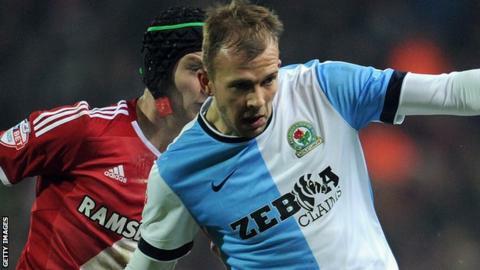 Blackburn have rejected an offer from Middlesbrough for striker Jordan Rhodes, Rovers boss Gary Bowyer says. The 25-year-old Scotland international had asked for talks with the Teesside club after a reported £12m bid was made for him. "Yes, Middlesbrough have been in touch. I think they've put some figures to our owners," Bowyer told BBC Radio 5 live. With Blackburn still under a transfer embargo for breaching Financial Fair Play rules, free agents Sacha Petshi, Bengali-Fode Koita and Danny Guthrie have been the only signings before the new season, with Tom Cairney and Rudy Gestede leaving for undisclosed fees. After beginning his career at Ipswich, Rhodes joined Rovers for a club record £8m from Huddersfield Town in 2012. He is contracted until 2019 at Ewood Park and scored 21 goals last season after staying in Lancashire following two bids from Hull City. "He's been the subject of speculation in the whole two years I've been in charge and he's always dealt with it very well," Bowyer added. "He doesn't get affected by it and continues to do his job ever so well."